Another local PAC called "Supporting Students First" is funded by many of the same Corporations that funded "Unite For Education" many of whom stand to profit from higher taxes. There ought to be a law!! The 2015, all mail in, Off Cycle, election, in Gilbert brought massive new taxes for property owners to bear. Not only in Gilbert but across the state. The Unite For Education PAC spent over $33,000 on the Gilbert election. By the looks of the donor list, it appears that some corporations might be expecting some big favors (otherwise known as return on investment) from old 41 (Gilbert Public Schools). In any other industry this might be called racketeering. Total GUHD $1,657.27 or 30.6% of my total tax bill and they are asking for more but failed to how much my taxes will increase next year (as if it were free) if I vote for it. $ 555.64 You might be interest to know that MCCC has a budget for I believe just 12 schools that is 1 and 1/2 the total budge for the entire city of Phoenix. Total for schools $4,365.38 or 80.7% of my total tax bill. The last 2 overrides did not pass; so what is the new gambit to get more of your tax money? They plan to ask for 600% more money than the last time in two different ballot initiatives! Still no explanation on why the $300+ million they already have isn't sufficient to fund their spend thrift ways. Stunning! 11-8-15 How did Gilbert Public schools defraud Gilbert residents out if $$$$$ Millions? The November 2015 election brought somewhere in the neighborhood of $2 billion to the coffers of government K-12 schools in Arizona; and Gilbert was in on the gambit. But, we are told that the schools are cash strapped! No raises to teachers in years! Funding to schools going down every year! Schools falling down! Buses falling apart! The Legislature is selfish and hates children! TAX RATES HAVE MORE THAN DOUBLED IN FOUR YEARS! 2015 it increased to 5.2599/100. March 31, 2015 a 1.6% raise for all staff including, teachers. How fiscally responsible has GPS been lately? When the new “Left leaning” board took control last year, one of their first acts was to jettison the Zero Based Budgeting program put in place by the previous Conservative majority board https://en.wikipedia.org/wiki/Zero-based_budgeting. Now the Superintendent spends money freely without hindrance on whatever she desires, as the new board majority is little more than a “rubber stamp committee”. And those poor teachers who haven't had a raise in "like forever"? Click HERE to read the Minutes of these meetings. Click HERE to read how the 2% “one-time” stipend awarded in 2012 was made permanent on April 23, 2013, when teachers received a 3% salary increase. But teachers are poor! They need more money in order to feel appreciated! 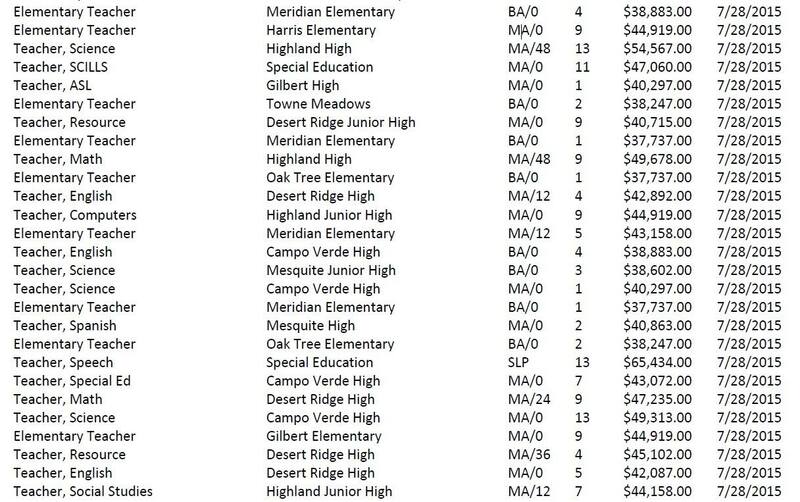 Here is a screen shot sample of a recently approved list of Gilbert Public Schools teacher salaries. These amounts are the base salaries and do not include PFP (pay for performance) or stipends if applicable or $18,000 benefits package. If you combine the starting pay with the benefits, BEGINNER’S pay in GPS is about $53,000 a year with top teacher salaries worth almost $90,000 a year. This is for a job with a 3 month vacation in the summer, Spring Break, Fall Break, Winter Break and Holidays off. "In 2014, half of working Americans reported an income at or below $28,851 (the median wage), and 51 percent reported an income of less than $30,000. Forty percent are making less than $20,000. The federal government considers a family of four living on an income of less than $24,250 to be impoverished." “But Arizona is 48th in education Spending!”. That’s what we hear and it is a ridiculous argument because the cost of living is far lower in Arizona than in most other places in the country. A modest 4 bedroom house in Gilbert can be had for less than $300,000. That same home in San Francisco will set you back $1.2million! To have the same quality of life that one would enjoy for $50,000 in Phoenix, you would need to make $87,000 a year in San Francisco and $116,000 a year in Manhattan!! So, now the state is promising $3.5 billion and draining the State Land Trust Fund in the process. If that deal goes through, it means a tax hike to the schools of about $5.5 Billion in an off cycle election!!!! THIS IS "NO TAXATION WITHOUT REPRESENTATION" TAKEN TO THE EXTREME!